Lengthwise, the Šebrelje plateau expands on about 6.5 km in the north-south direction and widthwise, on about 2 km in the east-west direction. The altitude of the plateau reaches 260 m on the northern side by the Idrijca river and 1079 m on the southern side with the Vrhovec summit. 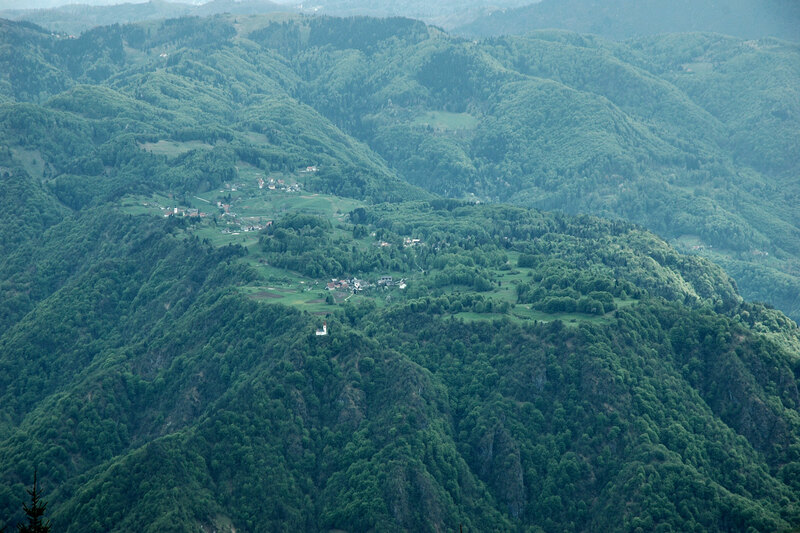 The central part of the plateau is densely populated; here lies the village of Šebrelje with its four parts: Dolenja Vas, Srednja Vas, Gorenja Vas and Kurji Vrh. 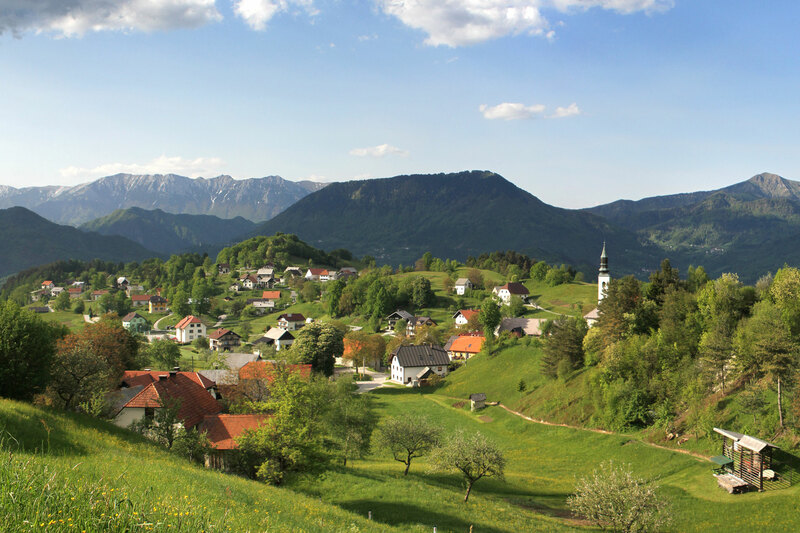 The highest of all is small settlement of Šebreljski Vrh, which also has the highest homestead called Pri Lokvarju. Šebrelje is connected to the valley of the Idrijca river by a rather steep but well-maintained asphalt road, which is suitable for bus transport. It’s also perfect for cycling tours. The road connection leads on to Šebreljski Vrh towards the village of Idrijske Krnice and further on to the town of Spodnja Idrija or to Oblakov Vrh, Trebuša, Vojsko or Kanomlja and on to Spodnja Idrija. According to some sources on church administrative organization in the area, the founding of the village of Šebrelje dates back to the 11th century. Throughout history, the locals were engaged in agriculture and livestock breeding. They already took on seasonal jobs in the time of Austria-Hungary, which made their modest lives on barren soil a bit easier. Today, the village has over 300 residents, but the biggest population lived in this area in 1860 (900 residents). 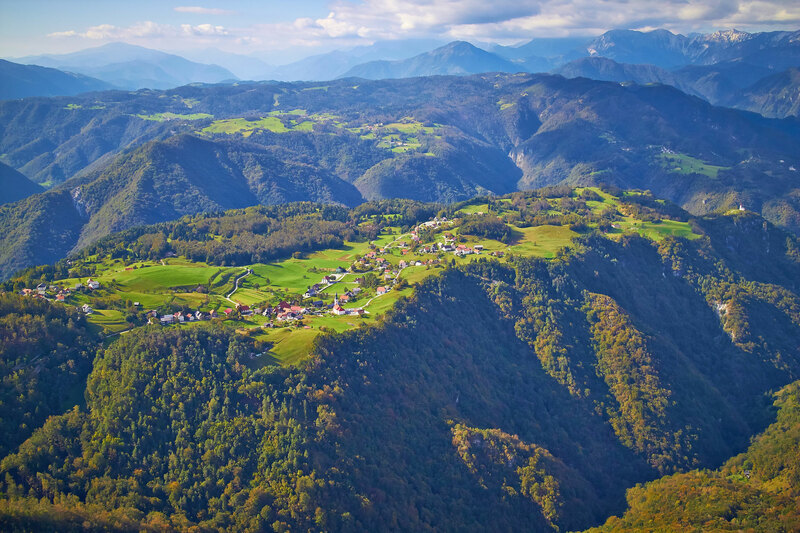 Nowadays, the locals earn their daily bread mainly in the factories in Cerkno, Spodnja Idrija and Idrija. In the 2nd half of the 19th century, the local children could already gain knowledge at the school run by the parish, which in 1913 moved to a newly constructed school building that still serves its purpose almost without changes. Near the school building stands a monument to victims and fighters who lost their lives in WWII. In Gorenja Vas, there is a parish church, which was built in 1767 and dedicated to the martyr St. George in 1777. A monument to those who fell in WWI, put up in 1922, found its place in the village cemetery next to the church. The steep slope under the small Church of St. John the Baptist is where the archaeological site of Divje Babe is located. The finds at the site prove that the area was already populated as early as 45,000 years ago or even earlier. The Church of St. John the Baptist in Šebrelje is located in a place with extremely powerful natural energy, which is believed to be the most powerful energy point in Slovenia. There used to be a temple dedicated to a solar deity in this spot. The energy points in the surrounding area of the church are marked with pebble stones. 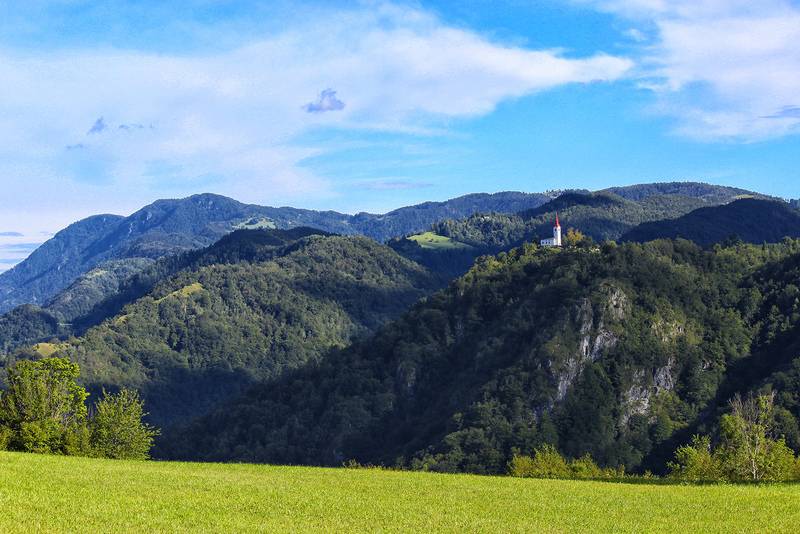 Left of the village is a natural rock called Polževa luknja or Snail’s Hole in English, which forms a tročan, the principle of triad, with the rock that lies above it. The triad is an expression of an age-old belief in the three fundamental forces of nature. The church is located at the tip of a well-known pentagram, which, apart from the Church of St. John the Baptist, is composed of the Church of St. George in the middle village of Šebrelje, the Church of St. Ursula in Jagršče, the Church of St. Paul in Želin and the spot height 553 at the Roglca summit. Within the span of the last 45,000 years this place was a juncture of many cultures. This also resulted in the changing temple forms. People had always felt comfortable at the location of the current Church of St. John the Baptist due to its extremely strong energies; they healed themselves here and also sought contact with deities or god. There are three types of locations near this church where a presence of natural energies is concentrated. We can feel them according to their effect on the energy chakras in our body. The photo depicts the Church of St. John the Baptist in Šebrelje as seen from the village of Police. It is said that in the past this excellent culinary creation was supplied to gourmands in the area of Trieste and Gorizia. Nowadays, the Šebrelje stuffed pork stomach is a mandatory “stop” for all those who enjoy spoiling their taste buds. Oral sources state that the production of this delicacy goes more than 200 years back when it was supplied to connoisseurs in the area of Gorizia and Trieste. Today, the Šebrelje stuffed pork stomach is recognizable by its specific oval shape and sensory and gastronomic properties. For years it has been among Slovene products with protected geographical indication on national level. It was recognized by European Commission as well. Its distinctiveness is in the composition of high-quality pork meat, a small share of bacon and spices, and also in the special climate conditions used for drying and maturing, which also contribute their share.